Zeiss products are of the highest quality and construction for the discriminating user, researcher, scientist. 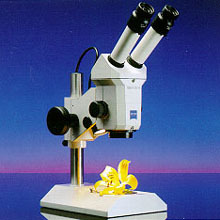 There microscopes and related products will last a lifetime of use. 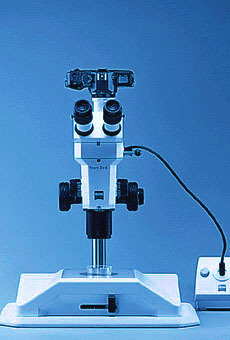 The stereo zoom line comprises stereo zoom microscopes that will fill most requirements from low magnification to high power. Intense sharp images, smooth operation and user friendliness are all trademarks of Zeiss. The name says it all. Below is a small sampling of the Zeiss product line. Please contact us directly for more information and pricing. 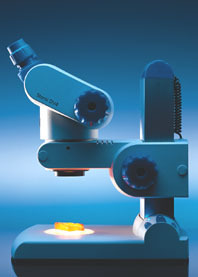 Stemi DV4 - versatile stereo zoom microscope for inspection, assembly, laboratory, medical and classroom use. Designed to provide ergonomic, fatigue-free working. 4:1 zoom (8x to 32x). Expandable from 2.4x to 64x. Field of view diameters up to 83.3mm . Nice stand and lighting arrangement with both top and bottom light controls. A wide variety of accessories is a available. Stemi 2000 - High performance makes it ideal for specialists involved in quality control, R & D, Medicine and biology. 7.7:1 zoom. 6.5x to 50x magnification. Magnifications up to 225x with additional lenses. 90mm working distance up to 286mm with additional lenses. 10x, 16x, and 25x eyepieces are available. A variety of stands and illumination are available also. 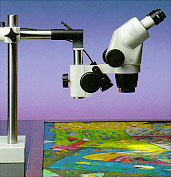 Stemi SV6 - The SV series microscopes are of the single objective telescope design. Start with a basic unit and add on as you go. Modular design and flexibility are the key attributes of this series. An ideal tool for your changing laboratory or research department. User friendly, compact, and ergonomic design add comfort to use. 0.8x to 5.0x magnification (8x to 50x viewable). Acromat S objective,. Plan acro available. Additional lenses, camera ports, stands , eyepieces and lighting all available to suite your specific needs as a discriminating user.